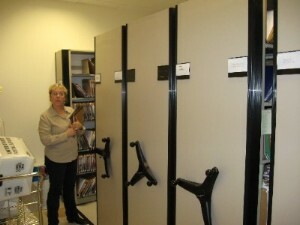 MTM Business Systems offers RFID File Tracking for mobile shelving systems. RFID systems include portable RFID readers which can quickly and efficiently inventory files and find specific files. File folders are labeled using our patent pending 'RFID+File Label' and shelves are also labeled with our RFID shelf tags. 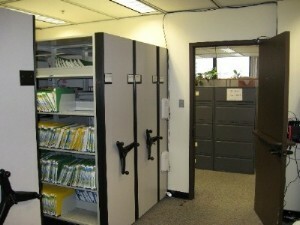 File Folders can be tracked to specific shelves within your mobile shelving system allowing for total control of files as they move in and out of the file room. MTM Business Systems professional services team includes a Certified Records Manager who can assist you in converting your existing filing system to a full scale RFID file tracking solution. RFID is a passive technology with tags only being read by an active reader. Readers are available in ceilings, doorways, walls and also at workstations and as a portable reader.